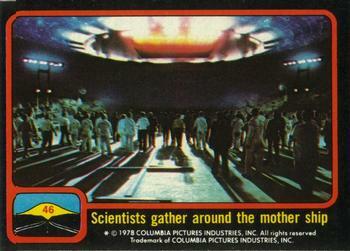 "There were a bunch of different cuts of Close Encounters, so this is kind of a truncated, kind of slightly faster version with all the stuff in it; it's really cool," an excited Topher told me days before his special screening, which I had the honor of attending (I gave him a vintage Close Encounters trading card for good luck before the projector rolled). "There are three different cuts, and then some outtakes, so we kind of put that stuff back in and it's cool, man. It's gonna be a fun time." Overall, Topher did a seamless job streamlining the film while allowing some great, signature moments to breathe, inventively integrating John Williams music from other projects to cover select scenes without tracks, and maintaining a healthy respect for the source material -- which arguably would have a hard time these days pleasing young, contemporary audiences that are used to the hyper Michael Bay/Transformers school of storytelling momentum. The trailer for Topher'sClose Encounters of the Third Kind: The Remix is posted on his new site, CerealPrize. While most stars these days post semi-naked selfies on Instagram or wax poetic in 140 characters or less on Twitter, Topher has taken his personal musings to the next level with his brand-new discovery site, geared for anyone who loves movies, music, TV, comedy and pop culture novelties. Topher posts fresh material every weekday, Monday through Friday, on the site, and you could lose track of time simply sifting through the little in-jokes and arcane references buried in the homepage artwork alone, designed exclusively by cartoonist/designer Ramon Perez.